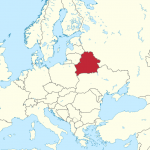 Belarus is situated in the center of Europe, bordering on Poland, Lithuania, Latvia, Russia and Ukraine. The capital is the city of Minsk. 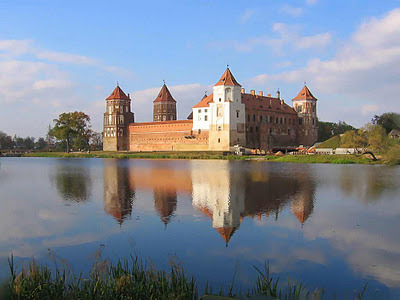 Although a landlocked country, Belarus is the land of more than 10 thousand lakes and 20 thousand rivers. Forests take one third of the territory and are considered the national wealth, while swamps account for 13% of it and are of significant climatic and hydrologic importance. The Belarusian marshlands are called “the lungs of Europe”, since they produce an enormous amount of oxygen. Besides, they serve as nesting places for rare species of birds and as a natural habitat for rare plants. The National Park “Belovezhskaya Pushcha” is inscribed in UNESCO World Heritage. Throughout many centuries of history, the Belarusian people created its unique and original culture and continue to celebrate today traditional folk customs and rites harmoniously interlaced with Christian traditions. The most serious environmental issue that Belarus still faces is the 1986 accident of the Chernobyl nuclear power plant. Almost 70% of the nuclear fallout from the plant landed on Belarusian territory and about 20% of the land remains contaminated. Government restrictions on residence and use of contaminated land are not strictly enforced, and the government even announced plans in 2004 to increase agricultural production in contaminated regions. Belarus faces significant air pollution largely because of the development of heavy industries. The most common pollutants are formaldehyde, carbon dioxide, and petroleum-related chemicals. Although some cities in Belarus are heavily polluted, especially industrial centers such as Salihorsk and Navapolatsk, the situation is not as dramatic as in most of the polluted industrial centres of former USSR. In recent years automobile exhaust is becoming the source of about half the air pollution in the cities. Water pollution, too, is less serious than in most of the successor states to the Soviet Union. A serious problem is, however, posed by salification of the water supply by the potash industry. However, all urban and rural dwellers have access to safe drinking water. The soils also contain unsafe levels of lead, zinc, copper and the agricultural chemical DDT. Belarus has vast forest areas but little of the country’s woodland is protected, in total 4.2 percent of Belarus’s land area. Biodiversity, soil pollution and the number of threatened species are areas of concern. The government has ratified international environmental agreements pertaining to air pollution, biodiversity, environmental modification, and ozone layer protection. The country has a big potential for renewable energy use. It has 9 million ha of forest out of which 53% are for commercial use. Wood production residues may provide with up to 23 TWh per year. Another solid potential is held in biogas, with 4.22 million cattle in year 2000. As for the wind power, Belarus has a capacity of 3.3 TWh per year. The output of solar energy systems in Belarus is estimated to be 40% and 10% of the in-coming solar energy for solar heating and solar electricity (PV), respectively. The hydropower potential is estimated to be 10 PJ with only 80 TJ used today. In this vision only 15% of the potential (1.5 PJ) are used. Being locked between other European countries, with flat terrain suitable for agricultural use, Belarus is already suffering consequences of climate changes reflected on yield, river flow and average annual temperature rise. Floods represent a significant problem for the country. Sudden and premature dramatic seasonal changes cause snow pack to melt and river overflow, flooding the surrounding terrain. Heavy storms occasionally occur, forcing evacuations, causing great damages on electric grids and great financial damage in general. Belarusians generally have no tradition of self-responsibility and common actions within community and fully rely on the efforts of local authorities in solving all community problems. Keeping in mind that local communities during the USSR times were very far from the aim of citizens' participation it is easier to understand that modern Belarus, still in the power of Lukashenko, has extremely limited social-political opportunities for local community development. People think that their living environment is determined from outside and they cannot make their life better by changing this environment. In most of cases local authorities are under strong pressure and control from national authorities, which are not interested in establishing dialogue with community activists and civil society organizations. However, the activity of civil society is increasing in Belarus — networks of resource centres, umbrella organisations for youth, women, and social welfare associations, centres for training and research, civil society publications and web sites and, of course, grassroots organisations. The obstacles facing civil society development in Belarus include the existence of a weak national consciousness, an underdeveloped private sector, the absence of a middle class and apathetic mass attitudes towards public issues. The development of a strong and vibrant civil society will therefore be significantly more difficult than in most other post-totalitarian states in Europe. To date, the country formed a sufficiently developed legal framework in the field of environmental protection and rational use of natural resources. Leading position in it is the Law «On Environmental Protection» (1992, amended 2002), which has universal significance. Other laws and codes are more narrow focus and regulate, respectively, the mechanisms of environmental protection, rational use and protection of individual natural resources, the solution of individual problems and other issues. A number of special laws are aimed at ensuring the ecological safety of population. They are related to radiation, sanitary, industrial safety, protection of population and territories from emergency situations of natural and man-made. Environmental legislation of Belarus is developing on several fronts. A national strategy for sustainable socio-economic development provides strategic components in the field of environmental protection and rational use of natural resources linked with social and economic development. To address medium-term objectives in the environmental field Belarus developed and implemented a five-year National Action Plan on Rational Use of Natural Resources and Environment and Environmental Health. Special purpose programs include the State Program for overcoming the consequences of the Chernobyl disaster, the State Program on Water and Sanitation «Clean Water», National Program for management of municipal waste management schemes placement of specially protected natural areas. In 2005-2008 the state implemented a program to improve the environmental situation in Naroch Lake. Scientific support of environmental policy is part of the state of scientific and technical programs. Crucial among them is the State Scientific-Technical Program «Ecological Safety». for import into the territory of the Republic of Belarus of ozone-depleting substances. In Belarus environmental tax does not fully compensate for the costs of environmental protection. And over time, there is a decrease in its share of these costs. So, if in 2006 it was 43%, in 2009 – only 30%. There is also a decrease in the absolute magnitude of the environmental tax. During the period from 2006 to 2009 it decreased by 6.3%. Its share in the revenue part of the country's budget has decreased from 1,5 to 0,9%, and relative to GDP – from 0.47 to 0.36%. For funding natural resource management and environmental protection in the country there are state budget environmental funds. In recent years, the means of environmental funds are spent to ensure the uninterrupted supply of quality drinking water to the population, the introduction of advanced waste-water treatment technologies, reducing air pollution, the problem of dumping of toxic waste into the commercial production of secondary material resources, increased use of renewable energy sources, improvement of recreation areas and other activities. The Global Compact Local Network in Belarus has done a lot of work in forming the national agenda of corporate social responsibility in the country. It has conducted numerous informational and educational activities in the sphere of CSR, both for businesses and undergraduate and graduate students, NGOs, and government representatives. One of the most prominent achievements in this area is the introduction of a new nomination “Socially responsible brand” at the annual contest “Brand of the year”.